This is one of the most underrated ways to get customers for interviews and even for your first sales. A webinar is a time-boxed information and feedback session conducted over the Internet. Usually, a webinar is split into two parts: a presentation and a Q&A. Hosting a webinar is a great way to initiate a two-way conversation with your potential customers. Start from a problem you're trying to solve. Is this a big enough problem? Are people care enough for this problem to spend time on your webinar? Where do people manifest their need for solving a problem? You should go there and announce that you'll be hosting a free webinar on this very topic. Are they moaning about current solutions on support forums or industry discussion groups? Go there. Are they writing reviews on a problem-related book on Amazon or sharing their opinion on Quora? Go there. You will spend time and put effort to prepare this webinar. All you need in return from the attendees is the way and social permission to contact them. Craft a simple sign up page for a webinar, asking potential attendees to leave a name and an email address. Free but limited number of attendees: Google Hangouts and Skype. Paid but feature-robust: GoToWebinar, Cisco WebEx, JoinMe and much, much more. Asking people to dedicate their time and attention to you - be sure to deliver top-notch insights. And do it in a professional, engaging and entertaining way. Divide your webinar into two parts. The first part is where you deliver a message, while the second one is about interactions with your audience. You can do a Q&A session, or a feedback session or just a free discussion. It's not a problem if you couldn't answer a certain question - you can always note it down and follow up on it in the future webinar or in any other way. You set a webinar to find potential customers for interviews. So say about that at the end of a webinar and ask attendees for a permission to reach to them to conduct 1-on-1 interviews. You can do it verbally or\and via the call to action at the end of a webinar. Reach out to attendees with answers to questions they've asked or additional information on the topic. Reach out to the most promising attendees to conduct interviews. Additionally you can record a webinar (inform your attendees upfront that you will be recording), upload it to Youtube and send the link to those who wanted to join the webinar but couldn't. Crowdsource becomes more and more popular recently. It allows people to "kill" time in a meaningful way, sometimes even earn few bucks. 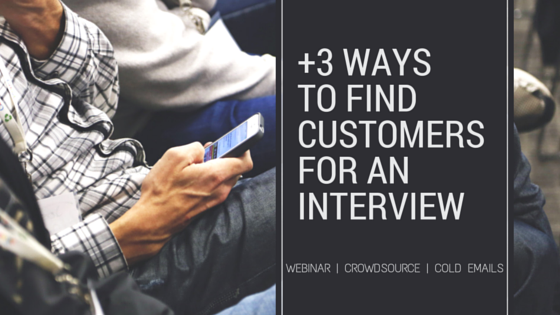 You can use the power of crowdsourcing to find people for interviews. For example, this post tells a story of how to get 100 customer interviews in 4 hours using mTurk. What do you need to do to find people for interviews on crowdsourcing sites? Be it mTurk or a Craigslist or any other platform it will probably offer a certain way to target your ad to a specific audience. Use it. You need to get as close to your potential customer group as possible. You want to talk to the right people. You potential customers. To identify them - ask everybody who replies to your ad to complete a quick questionnaire. It needs to filter out "your tribe". Reach out to those who filled out the questionnaire and qualified for an interview. Agree on the time and medium. And go ahead with interviews. Cold emailing creates this bad impression. You're reaching out to people you don't know with the offer they might not care about. Sounds a bit like spam, right? Well, maybe not if you do it right. Not just any list, but only the addresses of people who you know might be interested in the problem you're trying to solve. How to get those? You should know by now if you've read this post or that one. Don't just mass mail everyone with the same content. Personalize your message. And no, personalization does not mean to change only the name of the recipient. Personalized introduction: greet recipient by name and add a few lines of how do you know him or her. "Seen your presentation". "Loved your blog post". "Remember, at the conference...?". "Your book changed my life". Set a stage: explain the problem you're trying to solve and why you believe it will be beneficial for a recipient. Answer the "what is in it for me" question upfront. Call to action: an invitation to a call, link to a scheduling tool, request to reply. Highlight that you're not selling anything, you seek information. There are an endless number of tools that allows you to send mass emails. Those seem the most valuable for me: Streak and MailChimp. You can do it though in the old good manual way. Track who opened your email, who read it and who replied. Follow up with those who did. Remind (1 time) to those who didn't. Read more about the art of cold emails. The Internet gives you endless ways to reach out to your potential customers. If "95 ways..." was not enough, here you have another 3 ways to find customers for product interviews. A webinar is a powerful way to establish yourself as an industry expert and establish two-way communication with your potential customers at the same time. Crowdsourcing sites allow you to reach a large group of people and filter for those, the most valuable for your research. And cold emails might not be as evil as you think they are. Whatever way you'll choose, remember that you do it to learn, to create better products and to solve customer problems.